Why Use Tumbler Media? Tumbling media has four functions: 1) it delivers grit to hard-to-reach rock surfaces; 2) it is used to cushion fragile rock materials during the tumbling process; 3) it is used to improve the tumbling action in the tumbler barrel; and 4) it is used as a filler to make up for lost volume after the coarse grit and medium grit steps. Plastic pellets are to be used only in rotary tumblers (they produce too much "bounce" in a vibratory). 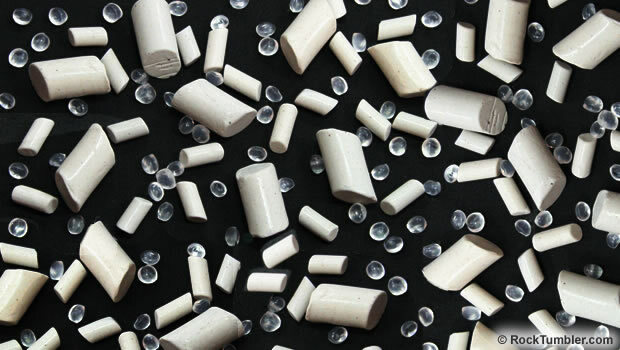 Ceramic pellets are mainly used in vibratory tumbling but many people use them in rotary tumblers instead of plastic media. If you are tumbling a load of large rocks they will have very few points of contact. However, if you add ceramic cylinders to fill the voids between the rocks there will be a lot more points of contact where grinding action can occur. The result will be faster grinding and smoothing done on surfaces where rock-to-rock contacts would not occur. When to use it? How much to use? Which size to use? We use these for filler and cushioning! 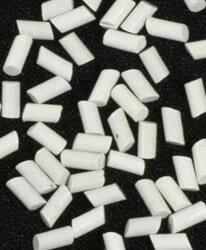 Large ceramic pellets work great for delivering grit or polish to difficult-to-reach surfaces. They improve the tumbling action when you have larger rocks in the barrel. They also serve as a filler to make up for volume lost during the coarse and medium grit steps. These angle-cut cylinders are approximately 3/8" (9mm) diameter x 5/8" (16mm) long. They can be washed and carried from step to step of the tumbling process along with your rocks. Large media will last through many tumbling cycles. When they wear down to a smaller size you can use them in place of small ceramic media. We use large ceramic media a lot more than small. Large is a little cheaper and it lasts longer - and it becomes small media after it has been used a while. We simply have a "media bucket" where we dump all of the media that comes out of a polishing step. Small media, large media, and small tumbled stones that are smaller than what we use are all in that bucket together and ready for service. Most of the media that we use is grabbed out of that bucket. We use these for cushioning! Small ceramic pellets work great to improve the tumbling action in your tumbler and for delivering grit or polish to difficult-to-reach surfaces. Running easy-to-bruise materials like obsidian and crystalline quartz with 50% small media can significantly reduce the bruising that they receive in the tumbler. In the polishing step lots of small cylinders will brighten up your polish. These angle-cut cylinders are approximately 3/16" (5mm) diameter x 3/8" (10mm) long. They can be washed and carried from step to step of the tumbling process. When used in the fine grit and polish stages they will last through many tumbling cycles. 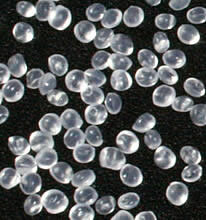 Plastic pellets are used for cushioning in rotary tumblers. They distribute around the barrel and absorb impacts between rocks in the tumbler. That helps reduce chipping and bruising of your tumbled stones. Its really important for stones like obsidian and quartz that bruise easily. 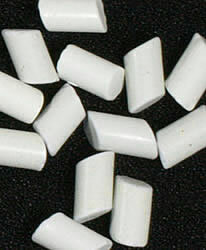 These plastic pellets are about 3/16" (4mm) in diameter and float for easy separation from the rock. Some people capture them using one of the tiny fish nets sold at tropical fish supply shops. Plastic pellets can be reused many times in the same size grit. They are only used in rotary and don't behave well in vibratory tumblers. Plastic media is not a good "filler" because it is too soft to contribute to the grinding process. Ceramic media does that much more effectively. We no longer use plastic media ourselves. We prefer ceramic media because it stays with the rocks through all steps of the tumbling process. We got tired of catching plastic media with a fish net and saving it in ziplock bags between tumbling steps. We still sell it because lots of our customers love it. We used to use plastic pellets exclusively, then we learned about ceramic media. It was a good day. Plastic media has to be captured and stored after each tumbling step because it is really hard to clean. If you use plastic media in fine grit you can't use it later in polish because some of the fine grit might be carried along. Similarly, if you use it in medium grit you can't use it with fine because some of the medium grit might contaminate the fine step. With ceramic media, you can rinse it with the rocks and it stays with the rocks all through the tumbling process. We use mostly large ceramic media because it will become small ceramic media after a few batches of tumbling. We also use small Lake Superior Agates (or any small round stone that needs a little more tumbling) as media because they are round and really really hard. They persist in the tumbler for weeks and weeks and if we use them as media we get a bonus of some nicely polished stones instead of some nicely polished media.